Select the microphone, should be based on the use of the occasion and the sound quality requirements, combined with the characteristics of a variety of microphones, considering the selection. For example, high-quality recording and broadcasting, the main requirements of good sound quality, Condenser microphone should be used, aluminum microphone or advanced moving coil microphone; for general amplification, the use of ordinary moving coil type can be; when the speaker moves from time to time or When speaking with a larger amplifier. There are, of course, other ways to categorize things, such as directionality and sound field strength, but none of these methods are within the scope of this article. The more common household choices are dynamic microphones and condenser microphones. Dynamic microphones are not all disadvantages, first of all moving coil microphones cheaper, simple operation, which makes the purchase of a lot lower threshold. And the performance is very stable, the direction of the radio is also very good. In KTV and many other places on the sound quality is not particularly high demand for the occasion, the microphone is moving coil. 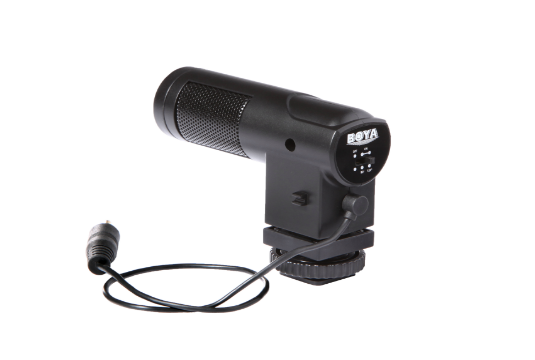 The BOYA BY-V01 is a stereo X/Y condenser microphone, this microphone provides greater control of your audio than the internal mics on DSLR camera, video cameras, or digital recorders. A switch for 90° or 120° pickup patterns allows you to adjust the directivity of the microphone. Some people want to do their own live webcast or have their own audiobooks and dubs. But dynamic microphones make it easy to record the ambient noise so the sound recorded can be very noisy. Under this condition, if the choice of dynamic microphone is not appropriate. If the higher the sound quality requirements, funding is sufficient enough, condenser microphone is a good choice. The core of the Condenser microphone consists of two thin metal films that produce a change in capacitance when the sound causes the metal film to vibrate, and these changes produce a measurable signal. But condenser microphone generally need to access 48V phantom power, but also need to connect the amplifier or mixer to work. How do BOYA wireless microphones work? What the best wireless microphones for singing ?